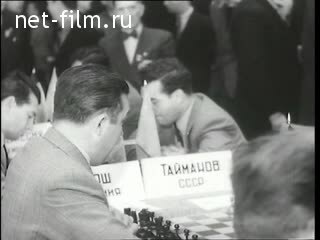 12-I Chess Olympiad in Moscow. Among the participants of the Olympiad chess: V. Smyslov, Chokyltya, S. Gligoric, Sabo et al International Meeting on the handball men's team between the GDR and the USSR at the stadium "Dynamo". Great sports festival on the artificial ice rink in Sokolniki Park in honor of the opening of the winter season. Opening of a new racetrack in Leningrad. Bike race at the stadium. International meeting on the football between the teams of the Soviet Union and Hungary at the Central Stadium. Lenin. 1. 12-I TSTSA Chess Olympiad in Moscow. 3. International meeting on the handball men's team between the GDR and the USSR at the stadium "Dynamo". 4. Great sports festival on the artificial ice rink in Sokolniki Park in honor of the opening of the winter season. 5. The oldest tourist USSR NM Gubanov. 6. Opening of a new racetrack in Leningrad. Bike race at the stadium. 7. International meeting on the football between the teams of the Soviet Union and Hungary at the Central Stadium.